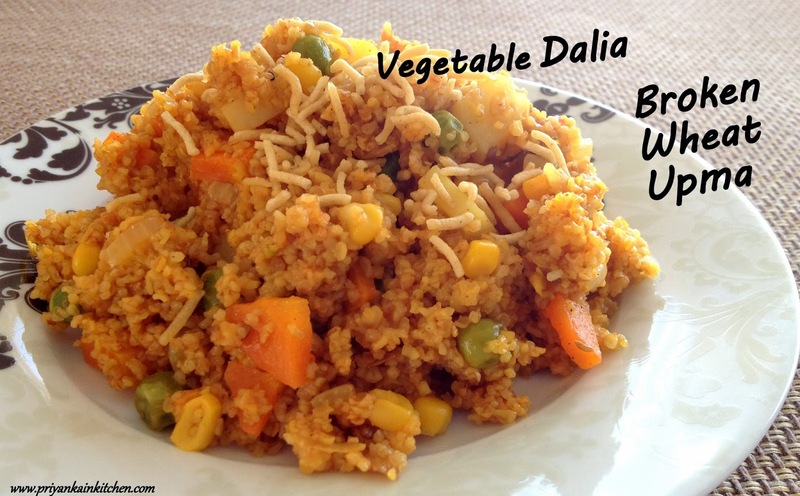 Vegetable Dalia is a very healthy recipe made up with lots of vegetables and Bulgur, sometimes also called broken wheat. Dalia mostly famous in the northern India, is high in fibre and can be cooked and substituted for rice. In many North Indian homes, elder people still prefer to have dalia with Dal or Kadhi instead of rice. 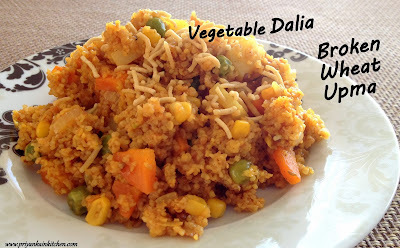 Vegetable Dalia recipe can be served as a breakfast dish or as a complete meal when served with yogurt or Dal. Heat a pressure cooker and add oil to it. When hot add cumin seeds and let them crackle. Add onions and green chilies. Stir fry until onions turn translucent. Now add tomato, carrots, potato, corn and peas. Stir fry for a minute. Add dalia and all the spices. Again mix well. Add 2 cups of water. Close the lid and cook on high until one whistle. Open the lid when pressure is released naturally. Mix everything gently. Serve hot garnished with bhujiya or yogurt or any curry.